IPL 2019: MI win by three wickets. 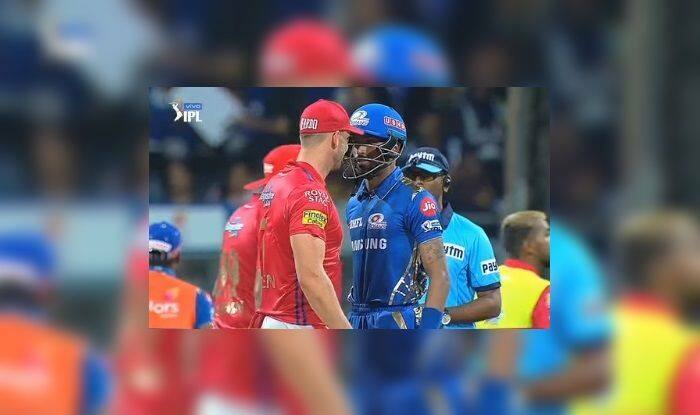 IPL 2019: After Keiron Pollard, it was Hardik Pandya’s turn to get a stare down from Hardus Viljoen during Mumbai Indians versus Kings XI Punjab at Wankhede Stadium. The incident took place at the end of 12 overs when Mumbai was on 94/4 and was looking down the barrel. Hardus walked straight up to Hardik mid-pitch and stared him in the eye. Before Hardik could understand what was happening, Hardus cleverly backed off. Hardik stood his ground while the eye contact was happening. Hardik scored 19 off 13 balls in his short stay. Here is the video of what transpired. Meanwhile, Pollard smashed a breathtaking 83 off 31 balls to get Mumbai close to 198. Earlier in the day, World Cup hopeful K.L. Rahul slammed an unbeaten hundred, his first in the Indian Premier League, as Kings XI Punjab also rode on Chris Gayle’s pyrotechnics to post 197/4 in 20 overs against Mumbai Indians here on Wednesday. Gayle was dismissed in the 13th over after which Kings XI slowed down a bit. But Rahul ensured they get to an above par score by smashing Hardik Pandya 6-4-6-6 in the first four deliveries of the 19th over and then hit Jasprit Bumrah for a four and six in the final over as 38 runs came in the last two overs. Gayle, typically, took time to get going and it was only in the fifth over that the legendary West Indian changed gears by hitting Jason Behrendorff for three sixes and one four as the Aussie leaked 23 runs. At the time of filing the copy, Mumbai won the match in a last-ball thriller by three wickets.